Everyone is enjoying this festival with the various street stalls and the beautiful and awful pictures. They are just Ekin! They are here and there illuminated by candlelight. They are more awful than ordinary and use red like blood. Seen by candle, they are even weirder. “I come to this festival every year, and I take Ekin’s photo every year,” says a nearby man. “Every year I can see a different face because they change by effect of candle.” That’s right, I can see a different face between on the way to and from. There are many festivals in Kochi. Yosakoi is very famous. But there are many less well-known festivals. For example, before Yosakoi festival starts, there is a firework festival, in Ochi-town the cosmos festival, the Dog-fighting festival and Hamono festival, so on. These are very important cultural events for Kochi. We have nice culture of gathering a lot of people. This Ekin festival is a very interesting festival too. The parking lot near the bicycle racetrack is full of cars every year. The bicycle racetrack’s parking area is a temporary parking space only during the festival. People coming to this festival are various people. There are from children to adult, not only Japanese but non-Japanese. This uchiwa shows cruelty. The left side man have neck and show it to protect his life. People’s neck was believed being amulet. This picture uses a lot of red like blood. Red like blood was believed being amulet too. This picture is “Oshu-Adachihara-yodanme-hitotsuya (奥州安達原 四段目 一つ家)” The right side old woman is Abe Tokiyori’s wife. She is killing the middle pregnant mother, and trying to steal the baby from her womb. Later, the old woman found that actually,the middle woman is the old woman’s daughter. Like this, Ekin contain irony and humor. Ekin’s mean is Eshi(artist) Kinzo.Kinzo was born in Bunka Bunsei era (文化文政時代:1804-1829). He learned Kano group. 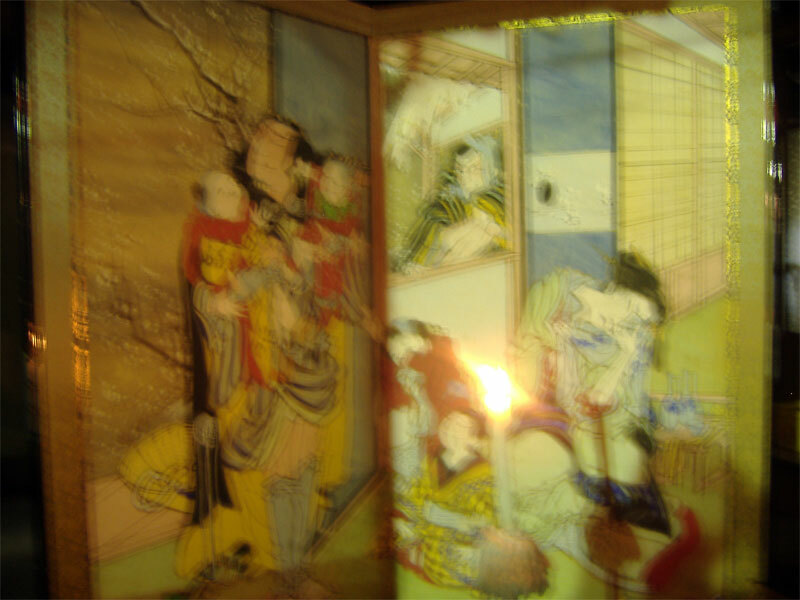 Ekin Byoubu-e (絵金屏風絵:folding screen pictures) was registered a tangible cultural asset in Kochi in April 2009. Overmatured Tyonin Bunka (町人文化:town culture of the socially) in Bunka Bunsei era spread to Kochi. So, maybe in his house there are composite drawings of actor, drawing of Samurai. From he was a child, he had a talent of drawing. He was learned style specific to Kano group by Oshiro eshi (お城絵師:scenic artist in castle), Yousai. Then he stood out. One day, the forged painting event happened. It seems to cause jealousy of his talent. Art dealership brought out his picture that he modeled from his dear teacher Kano Saigen on without any apology. Then the art dealership got faked seal and sold it to a merchant prince. Ekin was handed guilty sentences for drawing forged painting, and driven out Tosa castle town. There he roamed around and earned a living by drawing designs, painting kites and so on. In the end, he lived with his aunt in Akaoka in Kochi prefecture. He started to draw Shibai-Byobue (芝居屏風絵;acting folding screen) to against Suruda Hachiman’s Miya shibai (須留田八幡の宮芝居; acting in Suruda Hachiman shrine) as showing of summer festival. 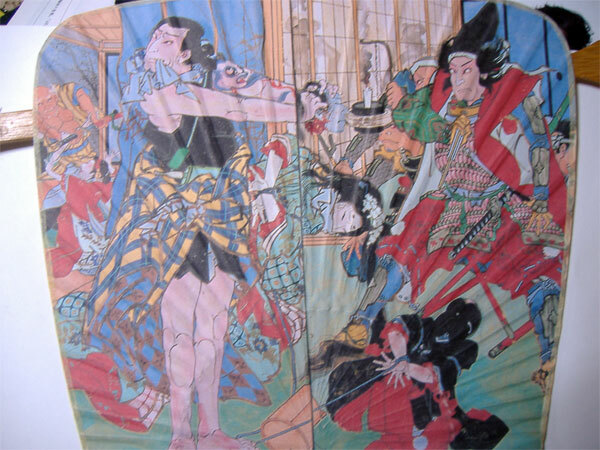 In that era, the fashions of art pictures were Ukiyoe (浮世絵), Shaseie (写生絵), Bunjine (文人絵), and Seiyoga(西洋画). Ukiyoe is drown pictures of beauty, view, actor. They used flesh color, yellow, black, orange, and blue, so on at Ukiyoe. Shaseiga is drawn plants, birds so on. They used only China ink at Shaseiga. Bunjinga is very simple, artless. Siege uses red (not like blood), white, pink so on. It is an oil painting. Ekin is used noticeable red. And it contains humor and irony. 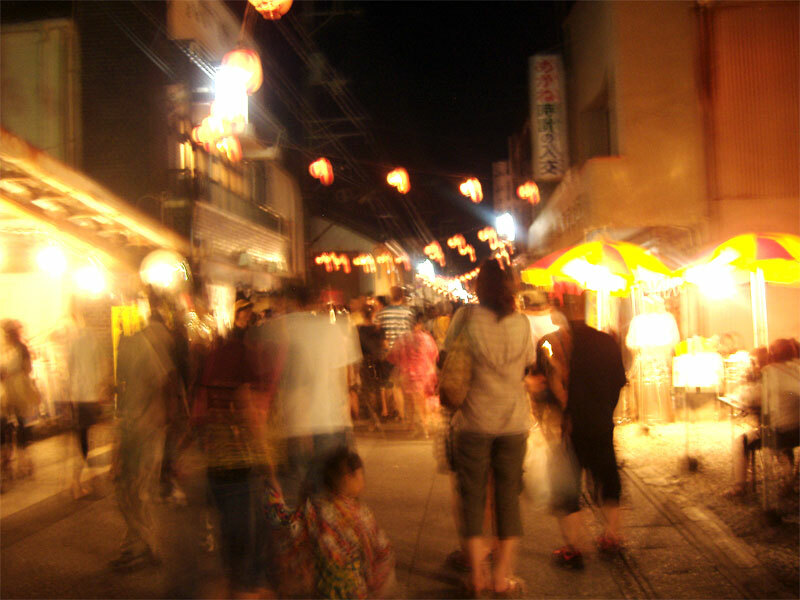 In 1977, the Akaoka honmachi Yokocho local shopping area’s people hoped to develop the place, started this festival. The true name the festival is Tosa Akaoka Ekin Matsuri. . His pictures have red like blood. The red like blood amulet to avoid bad vibes cause illness and other misfortune. So, people accepted his pictures. And there, we can find involved between Dozoku Shinko(土俗信仰:belief protecting the place) and Taishu Bunka(大衆文化:democratic culture). September 2010, Ekin-gura (絵金蔵) lent Ekin pictures for Kumamoto city contemporary art gallery. And due to wrong reek to protect mold and insects, five Ekin pictures changed color. five Ekin pictures changed green part to livid color. A man said ” I was very surprised. I regret we did not lend Ekin’s pictures that we have been protecting for 150 years.” The cause is insecticidal effect of aluminum phosphide. Ekin-gura lent Ekin for Itabashi(板橋) art museum too. The curator of the museum said, “Ekin used paints of mud, so Kumamoto city contemporary art gallery less understanding of using reek.” Now, changing in color stop. In the future, the museum will undertake inpaint the highest level (same level of in painting national heirloom) to protect extremely-high artistic value. In order to eliminate almost all of the risk of the destruction of Ekin’s art, we have to more understand about Ekin. There are no more beautiful and awful pictures in this world. We have to protect them. I saw Ekin picture, I felt the awfulness and beauty too. Moreover, people coming this festival really enjoyed. I believe we must not lose this festival and Ekin pictures’ awfulness and beauty. I didn’t know about Kinzo much but your article helped me to understand him. I was also surprised when I saw Ekin pictures changed their color on TV. I guess it’s really hard work to protect something old. I strongly believe Ekin is one of the most important culture in Kochi, and it should be protected long. Good article. I went to the Ekin Matsuri a long time ago, but I still remember how strange and cruel some of the paintings were. At that time there was no English guide and I could not speak Japanese so it was very difficult to understand the meaning of some paintings. From your article I have learnt a lot about the life of the artist and the importance to preserve the Eking paintings.